It is officially 2 days away from being acceptable to play holiday music, but we are ahead of the curve here at Ray's and want to get a jump start on our spirit, since it's takes Ray a while to agree to put up decorations. If you are on the bandwagon and in the neighborhood we suggest that you check out the Bucktown Bazaar, this weekend at Holstein park (right around the corner from us). It will highlight everything from crafts to fine art, with a focus on local vendors, and it's a great place to jumpstart your holiday shopping. Saturday and Sunday (Nov 30 & Dec 1) from 11am-5pm. You can read more about the event here, and below are some pics of past items from the event's Facebook page. If you have horrendous eyesight, chances are you know the secret joy of the holidays - take off your glasses, stare at some holiday lights, and cue the inspirational magic! (But if your eyes are as bad as mine, just be sure not to move). If you're a holiday light junkie, you should definitely check out tonight's festivities on Michigan Avenue. The Magnificent Mile Lights Festival is today, just off of the Chicago Red line stop on the El. It's one of the few outdoor events during the colder season, but well worth bundling up. If you can look past the garishly corporate sponsors, they do offer some great family-friendly activities. Lights Festival Lane offers activities such as painting part of a large mural project, a photo booth, an appearance by some Disney Star that we've never heard of (Megan Nicole? maybe your kids know who she is…), not to mention a chance to meet Chicago's most watched morning news team! Yay! If you thought a 0 degree windchill meant no outdoor music, you were wrong! Granted, the last performance we can find begins at 3pm, so they kept it to the warmest part of the day, but you can check out the music line up here. And Oh My, if you're aching for a celebrity appearance that will resonate with you, while you watch Disney stars with your children, I am pleased to announce that the one, the only, the age defying Mario Lopez will be hosting the "Largest Holiday Carol" event put on by 93.9fm. All kidding aside, the real pull for the festival is the Tree Lighting Parade which really ushers in Chicago's Holiday Spirit. Lots of stores stay open a bit longer during the Holiday events, so if you are not keen on any of the activities, you can still grab a cider/hot chocolate/coffee/nipper, and wander around shopping and looking at the lights (being guided by your responsible companion if you've taken off your glasses) until your fingers get numb and you return to the warm oasis of Ray's. party at Fat Cat on Broadway Avenue. showcase via Curbside Splendor. You can find the full schedule here. Details: Sunday November 24th, at 1345 W Argyle Street, (Chicago IL duh), 11am-5pm. So this here manager of Ray's has 2 main loves: Beer, and History. So naturally when I heard that Sue (our Dinosaur at the Field Museum) was the inspiration for a new beer brewed by locals at Off Color, I had to check up on the news. 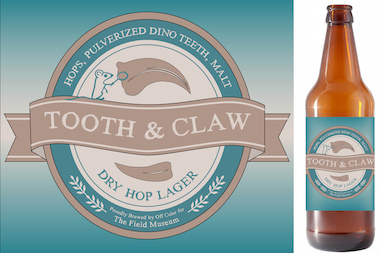 The original name for the collaborative beer was going to be "Sue Brew", which had a certain ring to it, but "Tooth & Claw" was settled on instead. Seeing as how Sue is such a big attraction for kids, and beer should not be, it seemed a more subtle homage might be appropriate. The tap handle is actually a reproduction of one of Sue's claws! You can only find it at the Field Museum, which happens to be a great place to spend a day now that the weather is turning, and below are some helpful links and ideas about how to spend your time in between trips to the tap. 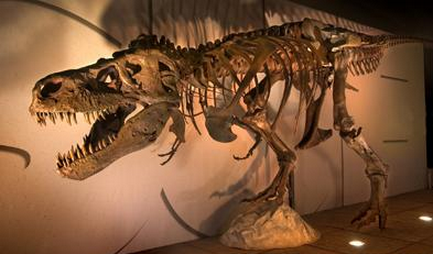 -Dozin' with the Dinos - You and your family can actually have a SLEEPOVER with Sue!